There are several web sites that show maps or give descriptions of loop rides around Girona. See the Links and Other Clicks section at the end of this page for more details. At one point Tanya and I had visions of living in Girona and thought we should spend a few months there to see what it’s really like. That vision disappeared but we decided we might as well see what Girona is like during our European trip. My first reaction was that Girona would not be a great place to live. The city is not particularly bike friendly, with very few bike lanes or bike paths. Fortunately the drivers are very courteous. There are roundabouts everywhere, and innumerable traffic lights, many just for pedestrians. The traffic lights seem to turn red at arbitrary times: I’ve been stopped many times at intersections where there were no cars waiting, and at pedestrian crossings where there were no pedestrians. It doesn’t seem to bother people though, perhaps because the pace of life here is slower than in the U.S. There is a lot of flat riding to just get to the “good” stuff – the hills. Boulder, Colorado, where I lived for several decades, has climbs that leave right from the city, but in Girona you have to ride on the flats. This is probably great for the pros, who presumably want to warm up on the flats before they start climbing, and for groups of riders who want to get in some miles. For Tanya and me it hasn’t been so good because neither of us wants to ride lots of flats in the sun just to get to the good riding. But Girona has grown on us. The old city is wonderful, there’s culture, there’s a University – although I suspect one would have to learn Catalan to listen to talks there. And over time I suspect the ability to ride on flats as well as hills would become more appealing. 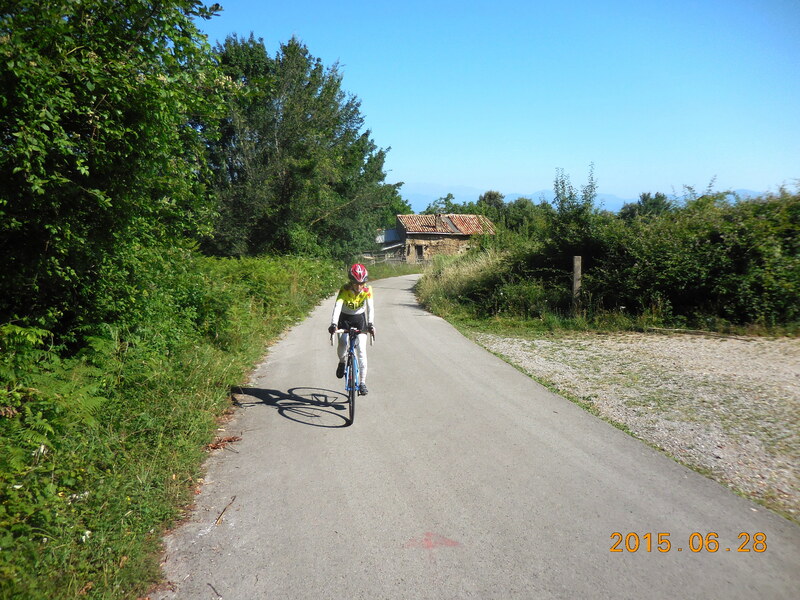 The closer part of the Pyrenees is relatively close and the sea is close enough to ride to. It’s probably a great place to come and train, or to live, but if you are looking for a vacation where you’ll do lots of good rides – and especially climbs – I wouldn’t choose Girona. Tanya and I didn’t want to do so much flat riding, so we drove out to the start of various rides. For that reason I haven’t described all the rides we did. You can get descriptions or maps of the loops in the web pages I list in the Links and Other Clicks section. Rocacorba is the iconic climb near Girona. It’s a bit over 13 km and about 790 meters (2,592′) of ascent. The signs by the road say that it’s 13.8 km and 881 meters of ascent, both of which seem high, especially the elevation gain. It’s worth doing if you want to check off the toughest climb near Girona, but it’s not a great climb as climbs go. It’s a checklist, not a classic, climb. Ride or drive up to Banyoles. If you drive through town and along the lake, there are lots of shaded parking spots. Or you can do what I did and go along the GI-524 to the GIV-5247 turnoff to Pujarnol. Turn left and park on the left side of the road by the factory. The climb starts easily for about 2.5 km then gets steeper. The road surface is generally good except for a few places where it is starting to crack. Near the top the gradient eases and even goes downhill for a short way before rearing up again for the final 1.5 km. This is a great climb which you can do from two different directions, with the final 6.8 km and 470 meters (1,542′) of ascent in common. I rode it both ways and prefer the climb from Cabanelles. The road surface is better from this side and there are no distractions like intersections or road splits. It’s a clean, elegant climb from this side, and I also liked it better than Rocacorba. From Girona drive up the C-66 to where it ends at the A-26 to Olot and the N-260 to Figueres. Take the N-260 to the right and follow it for about 9 km to a junction where you turn left for Cabanelles. Drive for about 500 meters to where you can park on either side of the road, just before the left turn for the GIP-5237 to Mare de Déu del Mont. Follow the GIP-5237 as it climbs gently for a little over 6 km. At around this point there is a sign that indicates the end of the GIP-5237, and the road gets smoother and lighter, and the gradient increases. Follow the road more steeply to the top of the mountain. From Girona drive up the C-66 to where it ends at the A-26 to Olot and the N-260 to Figueres. Follow the C-66 to the left as if you were merging onto the A-26 but instead take the exit to the right, signed for the GIV-5234 to Beuda. Leave the roundabout and climb the hill for maybe 100 meters, to where it sweeps to the right. Park on the left in a small hidden area that leads down to a footbridge. Follow the GIV-5234 up towards Beuda. At KmM 4 turn right following the GIV-5234 until it reaches the junction by the rock operation. Turn right and descend to where the road splits. Take the left hand road and climb a short way to where a road heads up to the left, signed to El Mont. Climb this for about 5.4 km to the intersection with the road from Cabanelles. The upper part of this section is rough in places, especially on some of the switchbacks. Turn left at the intersection and ride to the top of the mountain. The closest loop to Girona, it was apparently one of Lance Armstrong’s favorite rides. It has two good climbs, although neither is particularly steep. I rode it both ways and I think that clockwise is better, except that you then have a tedious 12 km ride on the flats back to Girona. The road surface on the Santa Pellaia section is smoother than that on the Els Àngels section. Just south of the Old City, cross one of the bridges and get on the east side of the river. Depending on where you start, this can probably best be accomplished by following signs for Sant Feliu de Guixols until you are on the left (east) side of he river. Head south on the left side of the river until you reach the roundabout. In Sant Sadurní de l’Heura the road curves left to a T-junction. Turn right at the T-junction and follow the GI-664 as it climbs gently to Santa Pellaia, which you reach between KmM 7 and 6. Continue down the hill to Cassà de la Selva, which you reach at KmM 0. At the T-junction turn right following the sign for Girona. Just outside Cassà de la Selva merge onto the C-65 and follow this until you can bear right on the C-250 towards Quart and Girona est. Counter-Clockwise Loop: At the roundabout take the C-250 through Quart and merge onto the C-65 to Cassà de la Selva. Ride up the main street through town and where the hill crests turn left following the signs for the GI-664 to Sant Sadurní de l’Heura. Climb up to Santa Pellaia, which you reach between KmM 6 and 7. Continue down the the hill – there are some lovely sweeping turns on this section – and reach Sant Sadurní de l’Heura around KmM 18. At the end-of-town marker turn left to Monells, which is about 2 km away. Follow the road round Monells to the T-junction. Turn left and ride towards Madremanya. Just past Madremanya, turn left to Els Àngels, which you will reach after a climb of about 6 km. Descend down to the roundabout at the bottom and turn right back into Girona. This is a great ride that does three lovely climbs and three lovely descents. Two of the climbs are quite reasonable, and the third – which is really a separate out-and-back – is much steeper. The whole ride is about 102 km and 1790 meters (5,873 feet) of ascent. This is broken out as follows, showing the one-way distances. Anglès to Sant Hilari Sacalm – 24 km and 650 meters (2,133′) of ascent. Osor to Santuari del Coll (the steepest climb of the three) – 7 km and 460 meters (1,509′) of ascent. Santa Coloma de Farners to Sant Hilari Sacalm – 20 km and 670 meters (2,198′) of ascent. I drove out on the N-141 to Anglès and parked at the Dia supermarket by the roundabout on the way out of town towards Osor. Ride up the GI-542 towards Osor. It is initially a very gentle climb. At about KmM 5 you pass a sign for Les Mines del Orsor, which sounds like something out of Lord of the Rings. At KmM 9 you reach Osor. As you are leaving Osor, a road to the right goes to Santuari del Coll. 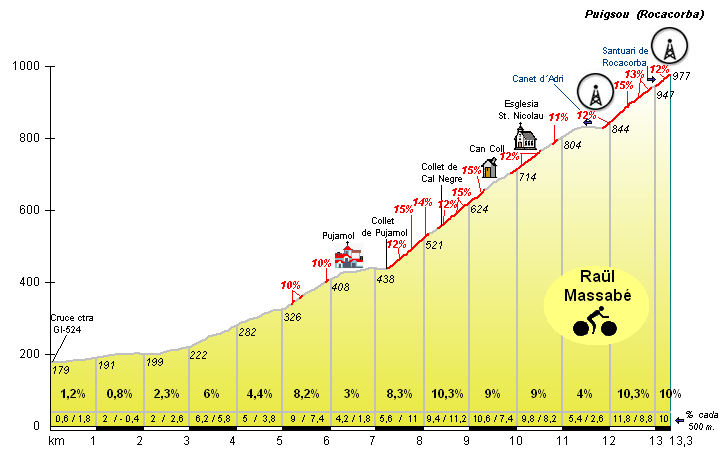 Turn right and climb steeply for about 7 km and 460 meters of ascent to Santuari del Coll. You can continue above the Santuari for about 0.5 km and 46 meters of ascent but the road is rougher. Back down at the GI-542 turn right and continue the long gradual climb to Sant Hilari Sacalm, which you reach just after KmM 24. Ride through town to the very top of the hill (there is a small Bonpreu supermarket on the left near the very top where you can refuel). 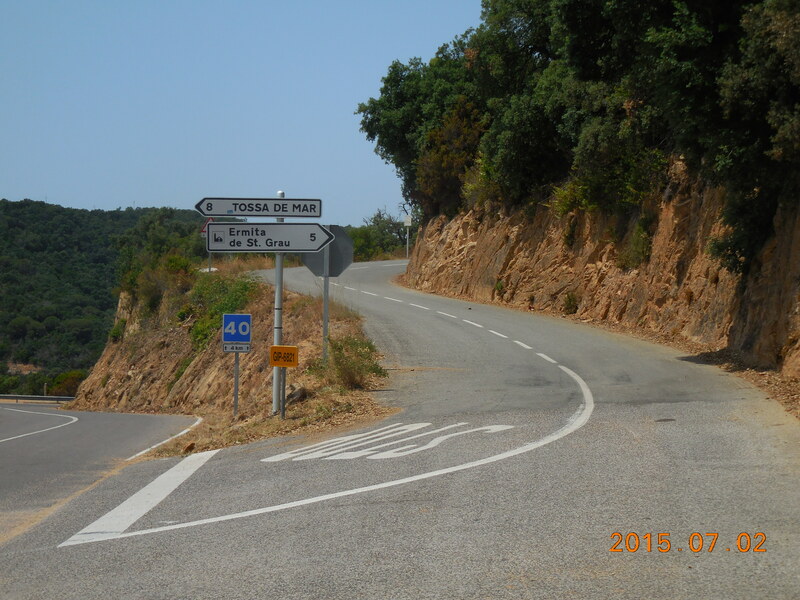 Then ride down the lovely twisty GI-551 to Santa Coloma de Farners. At KmM 20 you reach the Santa Coloma de Farners city limit sign. Turn round here and ride back up to Sant Hilari Sacalm then back down to Anglès. This ride is usually done as part of a longer loop, which you can read about in some of the links below. We didn’t want to ride too many flat roads in the heat so we drove to Banyoles and did an out-and-back to Olot, which was about 63 km with 950 meters (3,117′) of climbing. There is lots of parking along the lake by Banyoles. Ride along the GI-524, past the turnoff for Rocacorba, for about 8 km to a turnoff to the right to Santa Maria del Collell. Turn right and follow the GIP-5244 to Santa Maria del Collell. There’s an amazing building on the right here – which is a summer camp for kids and has a climbing wall on the right hand side. Continue along the GIP-5244 to the T-junction and turn right to El Torn. As you enter El Torn, turn left and follow this lovely quiet road to where it joins the GI-524 at El Sallent. Turn right on the GI-524 and continue to KmM 0 in Olot. 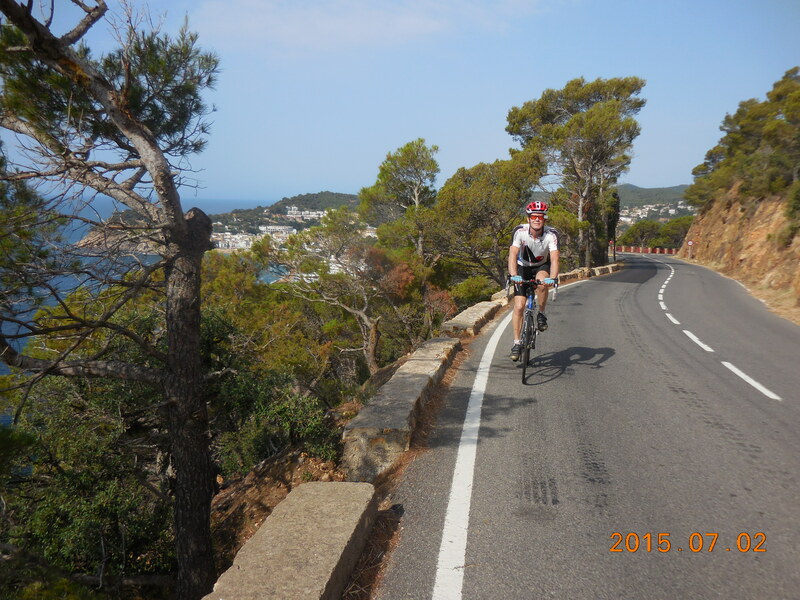 This is a lovely rolling ride along the coast road between Tossa de Mar and Sant Feliu de Guixols, followed by a delightful climb to Ermita de Sant Grau. It is about 67 km long with 1,265 meters (4,150′) of climbing. We started in Llagostera. Drive down the C-65 and exit on the C-253a for Llagostera. Drive along this road until you see signs pointing to a left turn to the town center and the cemetery. There is a good parking lot here, by the Hostal El Carril and a bike store on the corner of the street. Park here then continue riding on the C-253a until you reach the C-25. Cross this and continue along the GI-681 following signs for Tossa de Mar. In Tossa de Mar follow signs leftwards for Sant Feliu de Guixols. After many kilometers of rolling cycling along the beautiful coast road you reach a T-junction in Sant Feliu at about KmM 45. Turn around here and ride about 12 km back along the coast road to where the GIP-6821 heads up to Ermita de Sant Grau. Turn right and climb for about 6 km, including a short section of 14% just after Ermita de Sant Grau. Descend the other side and follow the road over the C-35 and into Llagostera. At the roundabout take the left turn and ride along the road back to your car. Michelin Map. A wonderful online map.